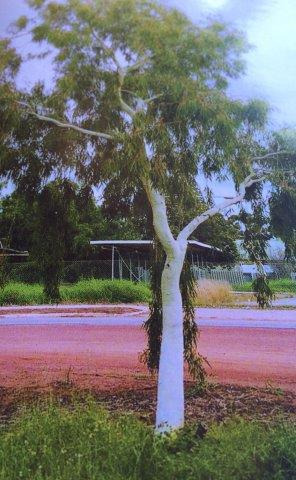 A striking smooth white trunked small tree from Western Australia and Central Australia and into the Northern Territory. Very drought and heat tolerant. Said to be slow growing(for a Eucalyptus!) It has been growing well in Ojai and tolerating 110F and a cold 18F with little protection. Photo from George Lullfitz's book. New plant for the US. Propagation Information: Seed germinates readily.Drench seed with a fungicide to prevent "damping off".